Thrift Center News - Planet Aid, Inc. Planet Aid Thrift Center Recently Featured in the Northwest Voice. The Planet Aid Thrift Center in Baltimore was recently featured in the Northwest Voice, a newspaper providing news and information for Northwest Baltimore County. The article highlighted facts about the Thrift Center and discussed the mission of Planet Aid. Read the full article by clicking the image and going to page 24. 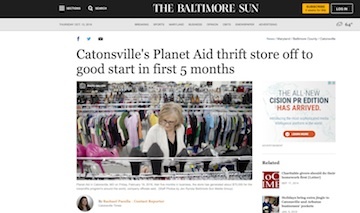 The Planet Aid Thrift Center in Baltimore was featured in the Baltimore Sun for the second time on February 24, 2016. The article highlighted the success of the store in its first 5 months in business. Read the full article by clicking the image. 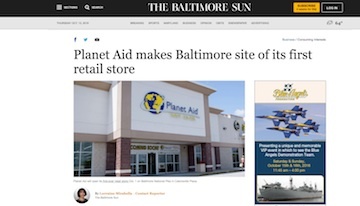 The Planet Aid Thrift Center in Baltimore was featured in the Baltimore Sun for the first time on September 29, 2015, right before the store opening on October 1. The article highlighted the mission of Planet Aid and facts about the Thrift Center. Read the full article by clicking the image.